A week in the wilds last summer reenergized Cheryl Irwin for teaching economics. Her experiences in Yellowstone National Park came through an Indiana State University class that concentrated on democracy in action and the economic ramifications of different park policies. "As a teacher of economics and geography, the experience at Yellowstone has renewed the excitement of teaching," said the West Vigo High School teacher. "The things we did and things we learned are much too long to list." That list was due in part to Indiana State University's Center for Economic Education. The center was founded during the 1960s after the national Council for Economic Education began in the 1950s. "It was the idea that pre-college students could learn economics and it would be really good for the country for more people to have a better background than just those who took economics in college," said John Conant, ISU center director and economics chair. Increasing foreclosures and bankruptcies have caused a rise in interest in economics and financial literacy, Conant said. "The current fiscal environment makes it easier to convince people that it's important," he said. Children in elementary school interact with economic concepts every day, including opportunity costs. "At that age, economics is how you make good choices - what you do at recess or how you spend your allowance," he said. "You start them young so when they're older it is second nature. They think about the opportunity costs when making their decisions. They're more likely to follow through as an adult when the issues are more complex if they started that as a kid." Chris McGrew, program consultant for the Indiana Council for Economic Education (CEE) and former social studies coordinator for the Indiana Department of Education, said understanding economics gives young people another set of tools to help them find a place in democratic society. "Students will have more choices if they are able to navigate the complexity of our changing society," he said. "An economic way of thinking provides students with another way to make rational decisions about their own lives." Since the 1960s, Indiana has remained on the forefront of economics education by encouraging elementary through high school teachers to incorporate economics into their lessons. Through the ISU center, summer classes are offered as well as after-school workshops. In the classes and workshops, teachers learn about new curriculums they can incorporate into their classes, as well as lessons and activities they can use. Jean McCleary, a kindergarten teacher at Hoosier Prairie Elementary, took the summer class "Taking the Eek Out of Economics" and along with another teacher submitted and received a grant to develop a mini-economy in their classes. "This year we received a continuation grant," she said. "In my classroom we talk about the economic terms, goods, services, wants and needs. We discuss coins and their values and learn how to trade pennies for a nickel." Some classrooms use "Play Dough economics" in which students create products out of Play Dough to trade as part of lessons on the gross domestic product. Other lessons include incorporating economics through children's literature. "You can integrate ideas across the curriculum," Conant said. "Almost all good children's literature has economic concepts in it. You can point out economics in them and use those while teaching language arts. Teachers can teach more than one subject at a time." Irwin incorporated lessons learned in Yellowstone into her economics and geography classes. 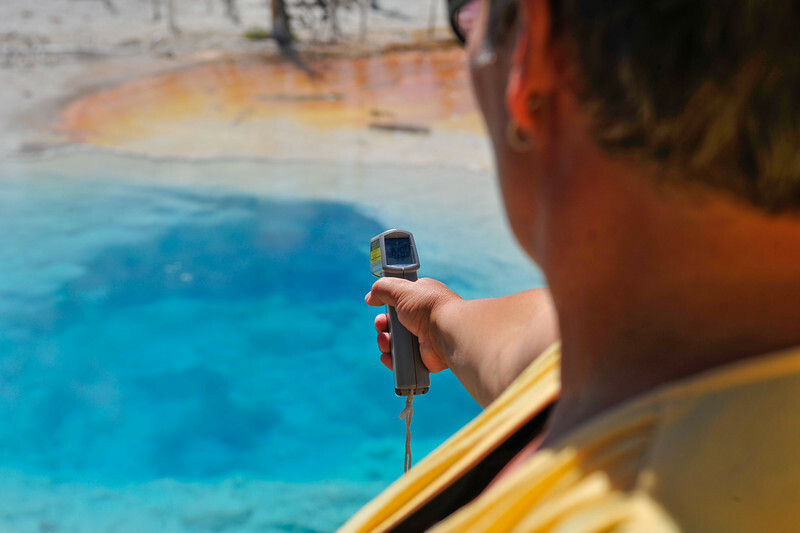 "When I returned from Yellowstone I created large posters from my photographs to create interest in the classroom," she said about incorporating her trip to the crater of the super volcano. "I took information I received about the Yellowstone volcano, shared it with my senior economics classes and had them write papers on what they thought the economic implications would be if there was indeed a volcanic eruption. In my sophomore geography classes we discussed volcanoes and earthquakes." Conant said that Yellowstone illustrates different economic concepts perfectly. "Yellowstone National Park provides not only a really interesting, fun environment, but a real-world place that you can study the economic concepts as they are working themselves out, particularly through a public discourse and decision making over how these public assets should be used," he said. McCleary said even students as young as her kindergartners can understand economic basics, and are eager for certain days. "My students are excited about the mini economy we have in the room and love when it is buying day," she said. "I feel it is important that my students begin to get familiar with economic terms and our money system at the kindergarten level so that they can expand and build on their economic knowledge as they progress through the grades." McGrew said there has been an increase in the number of teachers incorporating economics into their lessons, due in part to the Indiana Statewide Testing for Educational Progress-Plus (ISTEP+). "There has been a great deal of research that shows if content appears on a large-scale, high-stakes test like ISTEP+, teachers will begin teaching the content," he said. "If it is not on the test, they tend to ignore it, especially at the elementary levels." Economic concepts are included in the ISTEP+ social studies testing occurring this month. McGrew said there also has been a steady increase of teachers incorporating economics because of the council's work. "Indiana is one of the leaders in incorporating economic concepts into K-8," he said. "Part of that has to do with our social studies standards including economics, but most of it has to do with the training and materials provided by the ICEE through centers like the ISU Center for Economic Education." That training can benefit the classrooms. "Many times reading from the textbook may provide necessary information but doesn't create excitement," Irwin said. "First-hand information and personal experience can add needed excitement to the classroom." As part of that excitement, Irwin is now researching the possibilities of creating a program to take underprivileged students to Yellowstone during the summer of 2010. 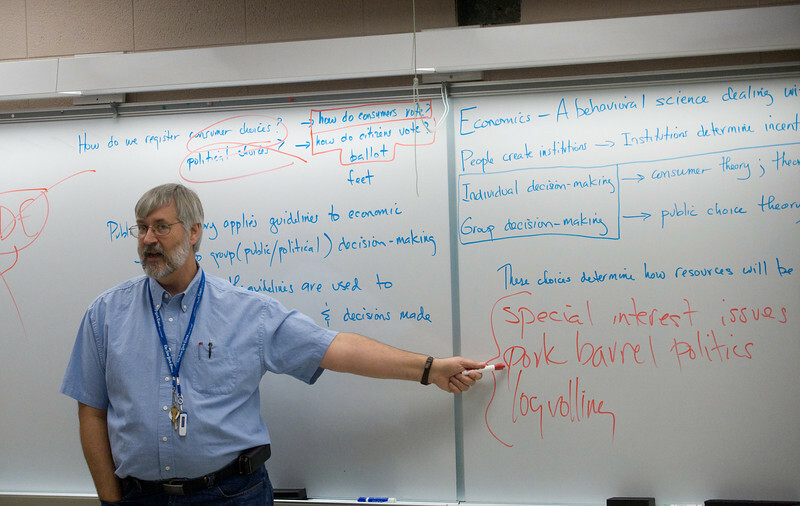 Cutline: John Conant, Indiana State University, ISU Center for Economic Education director and economics chair, teaches a class on economics surrounding Yellowstone National Park. Indiana State University's Center for Economic Education helps k-12 teachers with curriculum and lessons for teaching economics.